The EXIT procedure is an important strategy in the management of prenatally diagnosed congenital malformations. EXIT procedures offer the advantage of ensuring uteroplacental gas exchange while on placental support. The EXIT procedure helps enable surgeons to transform a potentially fatal neonatal emergency into a controlled environment to ensure a better outcome. EXIT procedures are performed at Cincinnati Children’s in an operating room that is specifically designed for performing fetal procedures and equipped to treat mother and baby in one location. The most common indication for the EXIT procedure is a fetus with an airway compromised by a neck mass (such as cervical teratoma or lymphangioma), trachea or laryngeal atresia (resulting in CHAOS), or severe micrognathia. The EXIT procedure allows time to secure the fetal airway by laryngoscopy, bronchoscopy, endotracheal intubation, or tracheostomy. The EXIT-to-Airway turns an airway emergency into a controlled, planned procedure. The EXIT-to-ECMO strategy is useful in cases of severe pulmonary or cardiac malformations in which separation from the uteroplacental circulation will lead to immediate instability in the newborn. In such cases, EXIT-to-ECMO strategy can be applied to secure the airway and insert venous and arterial cannulas for ECMO while on placental support. This approach avoids any period of hypoxia or acidosis during neonatal resuscitation. The Cincinnati Fetal Center currently offers EXIT-to-ECMO in cases of high-risk congenital diaphragmatic hernia (CDH) with lung-head circumference ratios (LHR) less than 1.0 with associated liver herniation, which is the highest risk category for mortality and morbidity. 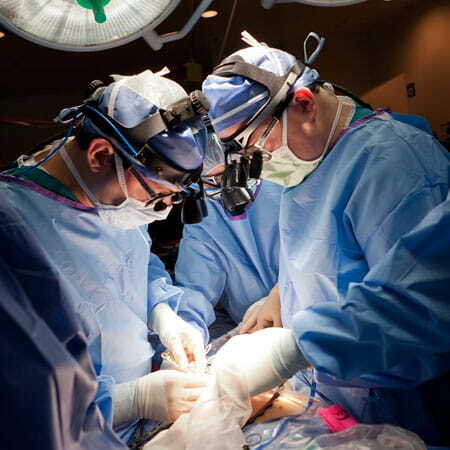 We also offer EXIT-to-ECMO for cases of severe aortic stenosis (AS) or hypoplastic left heart syndrome (HLHS) when they are associated with restrictive atrial septum in which severe instability would be anticipated before the newborn can be transferred from the delivery room to the cardiac catheterization lab at Cincinnati Children’s. The EXIT-to-Resection procedure can be appropriate for conditions involving large, high-risk chest masses such as congenital pulmonary airway malformation (CPAM) of the lung or mediastinal teratomas compromising the intrathoracic trachea. In these cases, the rationale for the EXIT strategy is to allow for the resection of the mass while on placental support, facilitating postnatal ventilation and venous return to the heart if ECMO is necessary for pulmonary hypoplasia.